They say love is blind. They say age is just a number. And my life taught me that they are right. I was in high school when I was introduced to Anil by a common friend on a social networking site. He was nine years older to me and was working in a company down south, while I was based in the north. Considering the fact that we were strangers to each other and the huge age gap, we didn't click instantly. However, slowly we started chatting more often and soon the short chats turned into long conversations and soon we started talking over the phone. I could talk to him just about anything under the Sun. He was the most kind and genuine person I had ever known. The age gap, which I was a bit wary about in the beginning faded away. We became very good friends and not a single day went by without us talking to each other. Also read: #MyStory: Three Years Later, I Discovered The Note He Wrote… After a year and a half of constant texting, frequent Skype chats and long phone calls, my parents came to know about us. Obviously, they were a bit concerned that their teenage daughter had been talking to an older man whom she had not even met yet. My mom told me to stay away from Anil, but I just couldn’t. All these months, I often wondered, what was it about Anil that I could not stop thinking about him. And then I got my answer which I shared with him one night. While talking on the phone with him, I told him that I had fallen for him. And he also confessed that he loved me. However, getting into a real relationship wasn’t easy for us, the very thought of what the future holds for us made me nervous. My parents had still not warmed up to the fact that their daughter had a guy friend who is nine years older to her and I couldn’t even image what they would do about this latest development. Also we came from totally different cultural background. To be honest, the age gap did make me worried. Soon he would reach a marriageable age, while I had a long way to go. How long would he wait for me? I told him about my concern but he was not worried at all. He told me that he could wait all his life for me, “I am in love with you and I will never let go of you. I want to spend the rest of my life with you.” And we hadn’t even met yet. (I know it sounds crazy.) The day we finally met is the most memorable day of my life. The first touch, the first hug and the first kiss… it felt so surreal. I cried for hours when he left after a couple of days. What followed was a love story like no other. He moved to the city nearby my home and got a new job so that we could meet as often as possible. Each time we met it would be like a dream for me. He would pamper me with gifts and I felt like nobody would ever love me like he did. We had our share of ups and downs, like any other couple, but the age issue never bothered us. Our fights and disagreements were never about our age or cultural differences. We were like the two pieces of a puzzle that looked totally different but fit perfectly with each other. Even when he moved to another country for work, our love didn’t change. I was madly in love with this man - he was my guiding light and my guardian angel. I believe that he being more experienced in life actually worked for our relationship -- his wisdom and composure balanced my impulsive and impatient nature. 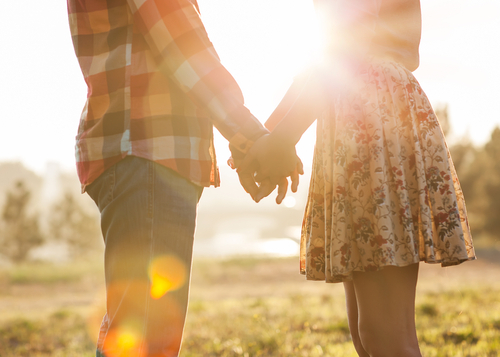 Also read: #MyStory: We Both Had Broken Hearts… Until We Found Each Other! But then everyone isn’t lucky to have a fairytale ending... After being together for four years, we had to go our separate ways. We never fell out of love but things just couldn't fall into place for us. Breaking up with him was the hardest thing I had to do. I spent days, nights, weeks and months sobbing and wishing that things could be perfect again. Gradually time healed my pain and my life. Today, I am a much stronger person and have no grudges against life for taking him away from me. In fact, I feel so blessed and grateful for experiencing love in its purest and strongest form. I am glad that I met him and I got to learn so much about life from him. He is getting married soon and I wish him all the best for his new life. I believe, our first love will always be one of the most special chapters of our lives. And we will always have a soft corner for our first love, no matter where life takes us. * Names changed to protect privacy. Images: Shutterstock Have a story you’d like to share? Just drop us an email here with your story – don’t forget to put #MyStory in the subject line. We’ll get back to you about whether we can feature it.